My saw blade story began a few years ago when I was just getting into woodwork. Going online to purchase a blade for my miter saw, I saw a whole bunch of different saws, got confused, and purchased the cheapest one because I thought they were all basically the same. Four days later when the saw arrived in a neatly-wrapped package, I was disappointed. When I tried to use it to make some crosscuts I found that it left me rough cuts and a lot of splinters. So I had to go online again, only now I took the time to actually read about the different saws to get myself informed. Here on my saw blade site I have reviewed my saw blade picks in the most popular categories. The idea is that my picks can help save you time as well as money, and help you to find the best saw blade for your woodwork project. When you need fine cross cuts for your woodwork projects, you need a quality fine finish blade like the 10-inch DEWALT DW3106P5D60I. 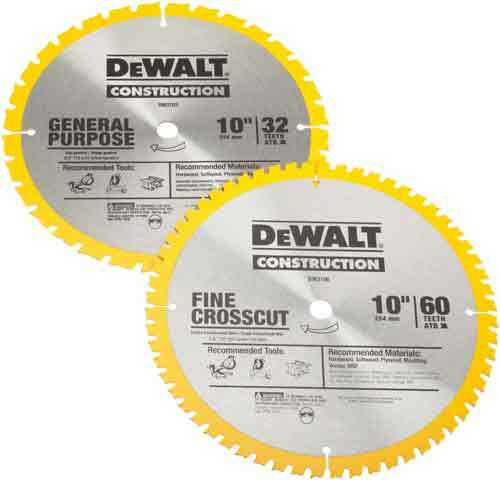 This 60-tooth saw blade earns the title of best 10-inch blade because it is a versatile, high-quality blade from one of the most recognized names in the woodwork tool industry – Dewalt. It’s not just the Dewalt name that makes the DEWALT DW3106P5D60I stand out. This saw blade is designed to work with both miter saws and table saws so, assuming you already own both types of saws, you will have a lot of flexibility with how you use it. Having a saw blade that can work with more than one saw will save you time and money. Many saw blades are made specifically to work with one type of saw, and trying to use them with an incompatible saw can easily lead to disaster. So it’s good to know that this saw blade can be safely used with both your miter and table saw to give you some fine cuts. Whether you need to cut through plywood, chipboard, hardwood, or softwood, the DEWALT DW3106P5D60I can handle the job. It is a professional-quality saw blade with 60 thin kerf teeth that allow you to cut through materials quickly while also giving you very accurate cuts and a smooth, fine finish. The plate of the blade has been computer-balanced to improve its cutting accuracy and give you a better finish on your cuts. 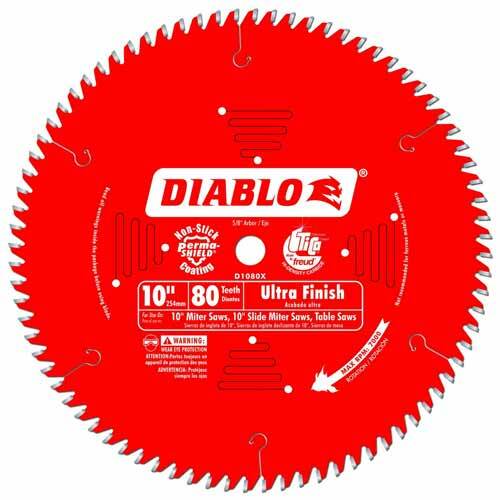 This is a saw blade that you will be able to use to tackle many projects in your workshop. The package comes with two blades so you can easily devote one to your miter saw and one to your table saw, but the fact that they are interchangeable gives them a great advantage. Got some stacked dados to cut? 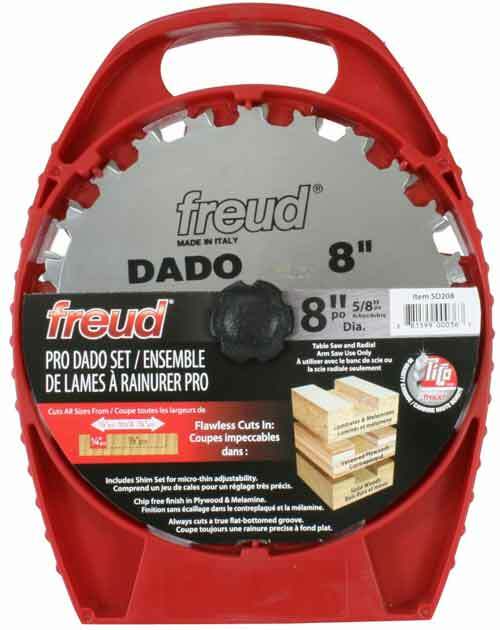 The Freud SD208 could very well be your best saw blade option. With a design that incorporates negative hook angles to give you clean, flat grooves and cuts that are virtually splinter-free, this is the saw blade you want for making your stacked dado cuts. When you purchase the Freud SD208 you get two 8-inch outside blades that you can re-sharpen when necessary to prolong their lifespan and help them to continue to make accurate cuts as time goes on. The cuts that you will get from the dado and outside blades will be accurate the first time, so you won’t waste any time making repeat cuts to get it right. As you can see, this will also save you money, as you will not have to throw out any pieces that are rendered useless because of cuts gone terribly wrong. Getting the measurements right is also important to ensure that you don’t waste your time and energy making repeat cuts. To help you to get the measurements right, there are 3x â…› inch spacers and 3 x 1/16- inch chippers included in the set when you purchase the Freud SD208. These both help you to fine-tune cuts that you make from 1/4-inch to 7/8-inch, giving you more accurate measurements, and more accurate cuts as a result. The shim set that is also included allows you to make a wider range of kerf adjustments so that you will have more control and the ability to make flawless finishes on your work pieces. The Freud SD208 saw blade was constructed with TiCo Hi-Density Carbide so it will be able to make precise cuts even after it has been sharpened repeatedly. The blades were designed to resist dulling for a very long time; this is a good thing because in woodwork a dull blade means more chances for splintering and inaccurate cuts. Rips and crosscuts are by far the two most common types of cuts that you will find yourself making when you do woodwork. The DEWALT DW3106P5 Saw Blade Combo Pack includes both types of saw blades for your 10-inch miter saw, and that is why it gets the title of best miter saw blade combo set. Both the DEWALT DW3106P5 blades are made with tungsten carbide that is extra tough and allows the blades to stay nice and sharp for much longer than your average saw blade. The tungsten carbide is also very durable and keeps a true edge to give you cleaner, smooth cuts. Having saw blades that are both durable and tough means that you will have them for a long time and get more value for your money; you will get more cuts out of them in the long term. This combo pack gives you two blades at a very affordable price. There are some 60-tooth crosscut blades that will cost the same as, or more than, the price you will pay to get both of the blades in this pack. That means you will save money as well as the time it would take you to shop around for a second blade, and who doesn’t like to save time and money? You can use the DEWALT DW3106P5 blades with both your miter saw and your sliding miter saw – one blade to do your general, rip cutting jobs and the other for your crosscutting jobs requiring a finer finish. When it comes to making glue line rip cuts on pieces of wood, very few saw blades can compete with the Freud LM74R010 (in my opinion anyway) and that is why it gets the title of best 10-inch, 30-tooth saw blade. With an impressive lifetime warranty behind it, this is one saw blade that is sure to be an asset to any woodwork shop. As the lifetime warranty suggests, Freud designed the LM74R010 to last virtually forever. It has a Perma-Shield coating that is non-stick and makes the blade less susceptible to corrosion, rusting, and gumming, all of which can significantly reduce the life of a blade in the long run. The thick MicroGain tips on the blade are made with carbide; this allows you to get more cuts from the blade in between the times when you have to sharpen it. This is a durable blade that you will not have to maintain as a regularly as blades of lesser quality. Even though it is a rip blade, the Freud LM74R010 has triple-chip teeth, so it can be used to make cuts on projects that require very clean finishes. The triple-chip teeth on the blade allows it to make very smooth, chip-free cuts on a wide variety of materials, including those that are brittle. This feature can help you to save time and money as it virtually eliminates the need for jointing or sanding when you are doing gluing and finishing woodworking jobs. 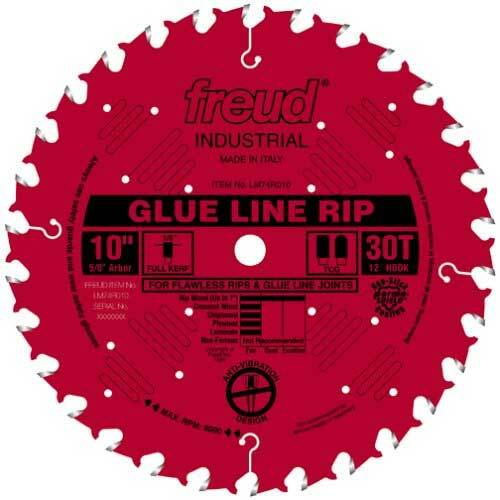 The Freud LM74R010 is designed to cut both hard and softwoods that are between 1/8-inch and 1-inch thick. While it can be used to cut thicker materials, this will likely result in cuts that are not as smooth as the ones that you will get when you use it to cut materials that are in the recommended range. A good rip blade is a staple in almost every woodwork shop and job site. 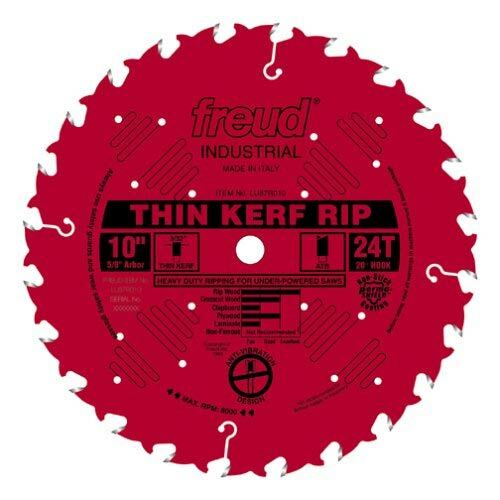 The Freud LU87R010 has been crowned best 24-tooth thin kerf saw blade because it is a high quality, fast cutting rip blade that can be used effectively with low-horsepower saws. Additionally, this blade is built for the long haul and, once properly maintained, will give you quality rip cuts for years to come. Designed to make true cuts even under heavy loads, the Freud LU87R010 is a true high-performance saw blade. It has several features that allow it to deliver superior cutting performance, like the high-density carbide that is used to make the tips of its 24 teeth, and its anti-vibration design that gives your cuts a cleaner finish as well as making your cutting jobs a lot less noisy. This saw blade also has Freud’s red Perma-shield coating – known to extend the life of a saw blade by reducing friction and the resulting heat buildup that too much friction can cause. The Perma-shield is also very effective at preventing debris and resin from building up on the surface of the blade. When there is a buildup of resin and debris the saw will have to work harder to cut through the material, and this can reduce its lifespan. Less buildup means more years of service for your saw blade. It was a close call between Dewalt and Freud for the title of best circular saw, but in the end the Freud D1080X Diablo emerged as the winner. This 10-inch ATB finish saw blade is a high-performance crosscut blade that is designed to be used on both hardwoods and softwoods alike. If you want a circular saw blade that you can use to get accurate, splinter-free crosscuts for your fine finish woodwork projects, look no further than the Freud D1080X Diablo. When you need to make fine-finish crosscuts in materials like oak, veneer plywood, and even delicate molding, the Freud D1080X Diablo is the saw blade for the job. 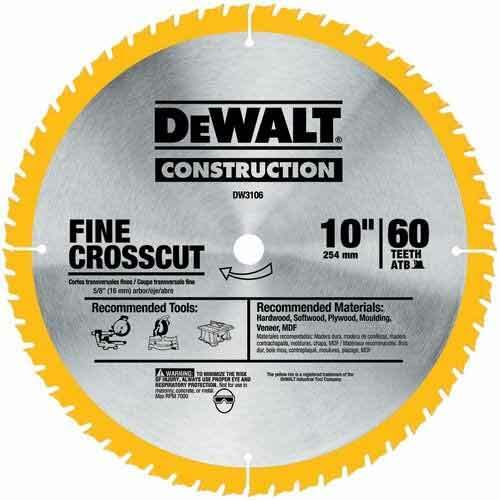 This 10-inch circular saw blade has all of 80 teeth to give you ultra fine finishes on every cut. As every true woodworker knows, more teeth means cleaner, smoother cuts with no splintering. You can expect to do little or no sanding on your work pieces when you cut with this saw blade, because the cuts that it makes are so clean and accurate. All 80 teeth on the Diablo are made with Freud’s Hi-Density carbide for enhanced durability and precision cutting performance. This carbide formula keeps the blade sharp longer and reduces the amount of wear and tear on the blade. Coupled with its non-stick Perma-Shield coating, the carbide formula makes this a very durable saw blade and greatly increases its lifespan. Use it with your table saw, miter saw, or sliding miter saw to get precision, fine finish cuts on even the most delicate woodwork projects. 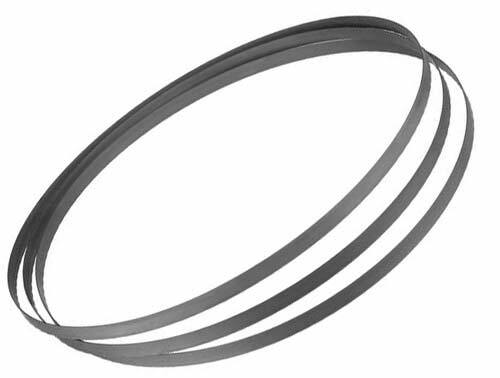 And the award for the best bandsaw blade goes to…the DEWALT DW3984C! 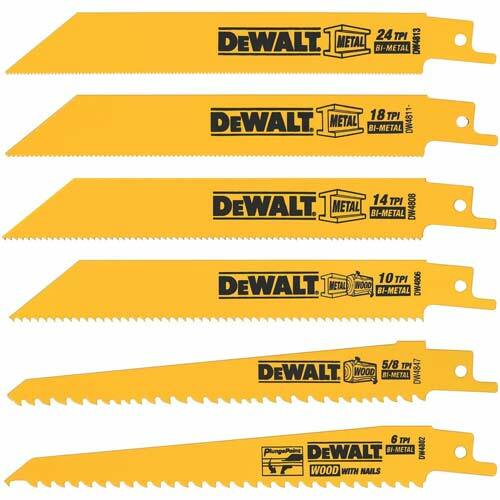 This pack of three portable band saw blades from DeWalt gives you incredibly durable and also very efficient cutting blades. You will get years of cutting action from these saw blades. These band saw blades were built to last and they have several features to ensure that they do just that. They have a tooth hardness of Rc 65-67 and are made with Matrix II high speed steel edges; this makes them more resistant to wear and heat. For even more durability, they are also made with 8% cobalt. Because they have 24 TPI they can be used to cut materials as thin as â…› inch. These band saws can cut more than just wood; they are also ideal for cutting thick and medium metal as well as thin-gauge metal. The blades each have a backer of alloy steel to help them resist fatigue, be able to make better cuts, and last longer. Ahh the good old reciprocating saw blade! I just could not leave one of these out of my best picks list. For the best reciprocating saw blade I choose the DEWALT DW4856 Metal/Woodcutting Reciprocating Saw Blade Set because in this set you get six high-quality saw blades that can be used for almost any job that you will have for a reciprocating saw. And if that wasn’t reason enough, the blades are compatible for use with the various brands of reciprocating saws so, no matter which saw you have as long as it is a reciprocating saw, you will be able to use these blades with it. The saw blades in this set were designed to be able to cut through a very wide range of materials including wood, plastic, metal, and drywall. As they can be used to cut so many different types of materials, there will be few cutting jobs that these reciprocating saw blades won’t be able to handle. With six options to choose from, you will always be able to find the perfect saw for each cutting task. The teeth on each of the six reciprocating blades in the set all have the raker tooth design, to enable them to make contact with a larger area as well as to make faster cuts. Faster cuts means that you will save on time as you will be able to complete projects sooner than later. Whatever brand reciprocating saw you have, all of the six saw blades in the DEWALT DW4856 set can be used with it to help you conquer the most common applications for reciprocating saws. Those were my best picks for saw blades. Every cutting job requires a specific type of blade and if you don’t know what you are looking for, chances are that you will choose the wrong one. Hopefully my best picks will help you to find the right saw blade for your cutting project so that you can create your next woodwork masterpiece faster and with amazing precision. If you also save some time and money in the process then I have done my job well. It has been my honor to serve you.